Use TB13HA1 to reference this item. The mission of this coin is to spread awareness of other vehicles on the road. Remember to ride smart and ride safe. No matter if you ride a motorcycle, ride a bike, or drive a car, be sure to let others around you know what you are going to do. Wether it be slow down, stop, turn left or turn right, be sure to signal your intentions. Be sure to signal in advance, and not at the last second. It could mean everything. This coin is on a mission. A mission to spread awareness of others on the road. Please move along soon to help spread the word. Found Coin and will be moving it to a new state! Dameetro let me discover this one at work today. 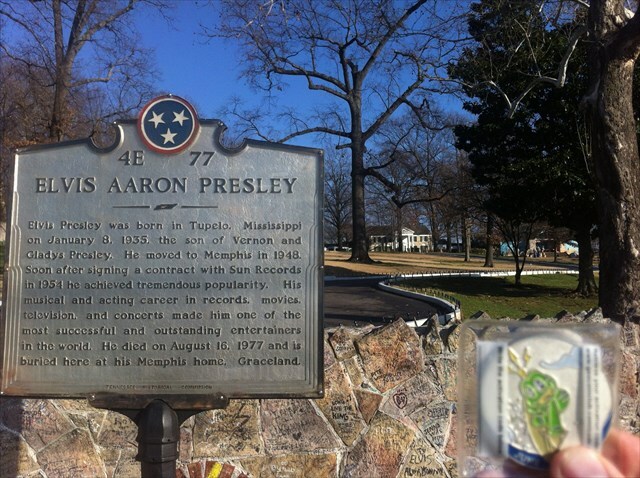 Here's a picture of your coin at the front gate of Elvis' Graceland in Memphis TN. I grabbed this one at lunch today. The cache it was placed in is in bad shape. I didn't want this trackable to get muggled or rained on. Will move along soon!